Something remarkable is taking place in our mother country. Late last month, a third party on the right overtook both major political parties in a national election, as significantly more people in England voted for the right over the left. The UK Independence Party (UKIP) is surging as a sort of British equivalent to the Tea Party, proposing a reduction in immigration and leaving the European Union. The UKIP received the most votes in May’s European Parliament elections (electing delegates known as MEPs) with 27.49 percent, followed by Labour with 25.40 percent and the Conservatives (or Tories) with 23.93 percent. It was the first time in over 100 years that a party other than Labour or Conservatives have won the most votes in a nationwide election. Most of the remaining vote went to the Green and Liberal Democrat parties - but with over 50 percent going to UKIP or the Conservatives, it is clear the country is undergoing a conservative shift. The UK has been led since 2010 by Prime Minister David Cameron of the Conservatives. Although the UKIP won the most votes in the UK’s European Parliament, it still has a lot of catching up to do in the UK’s two traditional legislative bodies. Cameron has only appointed three UKIP candidates to the 780-member House of Lords, and the UKIP has yet to win a single election in the House of Commons (MPs). Last week, the Conservatives won the Newark election for MP, with 44.9 percent of the vote. The UKIP candidate came in second with 25.8 percent, well ahead of Labour with only 17.6 percent. That means a whopping 70 percent voted for a right-leaning party. The UKIP has grown not only due to frustration over illegal immigration and loss of sovereignty to the European Union, but anger over joblessness, decreasing standards of living and high taxes. The similarities to America’s Tea Parties are striking, right down to a slightly lesser interest in social issues. The UKIP was formed in 1993, when it was formed in opposition to Britain joining the EU. In 2009, the party got a big boost, when the Conservatives’ biggest donor, Stuart Wheeler, donated £100,000 to the UKIP to aid in its opposition to the EU. He is now treasurer of the UKIP. 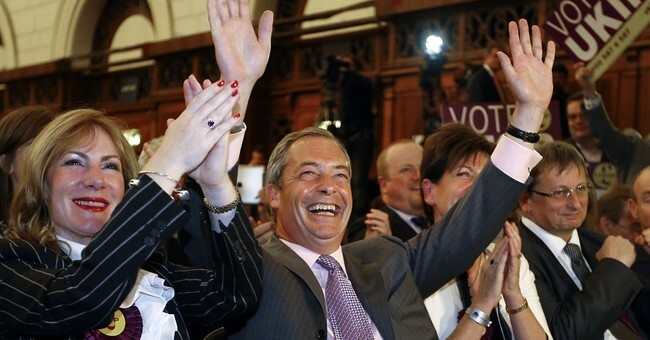 The UKIP is more of a populist party than the U.S. Tea Party. The UKIP supports civil unions, but opposes gay marriage. It does not go as far as some other nationalist parties like the French National Front, which is overt in its dislike for other immigrants based on their ethnic origin. The UKIP is more of a real free market Thatcherite party. Intriguingly, Britain has moved further to the right on immigration than the U.S., no doubt due to the strain on its relatively smaller economy. Both the Conservatives and UKIP object not only to illegal immigration, but loudly call for reducing legal immigration as well. Obviously, both the UKIP and the Conservatives are less conservative than the U.S. Republican Party. London Mayor Boris Johnson, a Conservative, endorsed Obama in the 2008 election. Prime Minister Cameron is even further to the left than his Conservative Party, supporting gay marriage and other socially liberal views. The party’s website is scrubbed free from almost any mention of its positions and philosophy other than one short list. Right-leaning nationalist parties in other European countries also did quite well in the European Parliament elections last month, although it is no surprise that England, with its close ties to the U.S. and its system of representative democracy, is moving further to the right than any other European country. Opposition to the socialism of the EU, with its intrusion into the economy, health care and the basic principles of the Magna Carta has finally found an effective voice in the UKIP. Although radical Muslims and other immigrants who aren’t loyal to England have gained a foothold, a growing movement to fight for what made England its best is emerging. As we once again commemorate the U.S.-English-Canadian landing at Normandy Beach on June 6, 1944, we remember the clash between Hitler’s Nazism and Western civilization that took place that day. Today, this battle has been renewed under the guise of socialism, communism and globalism. Thank God for the UKIP and others who recognize what is at stake in the 21st century - may they prevail.